Last week I had the privilege of being part of one of the most exciting fundraising conferences I’ve ever attended – The Ask Direct Fundraising Summer School. A group of highly talented people shared, inspired and challenged us to do better. Not just as fundraisers but as people too. I took a huge amount away from the experience, but wanted to share five key points that I felt were particularly important and needed to be circulated amongst a wider audience. This was the message from Beate Sorum of fundraising consultancy, b.bold. Very often in fundraising, in order to please internal audiences, we remove much of the joy from giving. Beate reminded us that when we remove the love, we weaken our appeals and hurt the cause we are supposed to be championing. So if you are good at fundraising, you should be prepared to say no to stupid requests that add nothing to the donor experience. We need to be less accommodating to those who want us to water down our message or send donors inappropriate information and requests. These actions serve no purpose other than to please a handful of people rather than those that matter – beneficiaries and donors. 2. Large organisations can learn from smaller ones. Caoileanne Appleby (of Bluefrog and ASN) and Simon Scriver (of changefundraising.com and One in Four) made me feel a little stupid by reminding me that the things that matter most to donors don’t depend on big budgets and lots of staff. Perhaps the most important part of their presentation was showing the impact of thanking promptly and properly. When you don’t have many donors, you make sure that they know they are needed! The before and after photographs of Simon’s thank you letters helps demonstrate just what can be achieved with a little thought – at no cost. What was equally impressive, was the impact of their programmes. Both reported rapidly increasing income. They shared simple ideas that anyone can use and demonstrated that there is really no excuse for poor thanking. And at each stage, you need to flatter. Fundraising isn’t just about showing how money has been used. It’s far more important to show the donor just how important they are in tackling the issues that we face. Unusually for a fundraising conference (but it should be an essential) we took some time to look at inequality in the workplace. That’s the charities we work for. Simone Joyaux, Jen Love (of Agents of Good), Rory Green (of Simon Fraser University in Vancouver but also known as Fundraiser Grrl) and Niamh Ferris (of the Royal College of Surgeons in Ireland) pointed out a few unsettling facts. For example, even though most fundraisers are women, just 32% (in the UK) are directors or heads of fundraising. Disturbingly, the pay imbalance can be as high as 21%. In discussions after the event, it was suggested that one reason for the imbalance was because women are less likely to ask for pay rises. I undertook a little research when I got back to work and found this study that demonstrates that the real reason is women are far more likely to be refused a pay rise. We were asked to think about what we could do to turn this situation around. A good first step is sharing their message. Ken Burnett closed the conference with a remarkable session calling for a revolution in fundraising. He suggested that we stop blaming others – like the press or politicians – for our lack of oversight. One of the areas he focused on was the fall in trust people have in charities. He shared some research undertaken by the Commission on the Donor Experience that found trust would increase by two-thirds if charities were transparent and gave control over how personal data was held and shared. Ken also shared one of my illustrations that I haven’t published on this blog before. 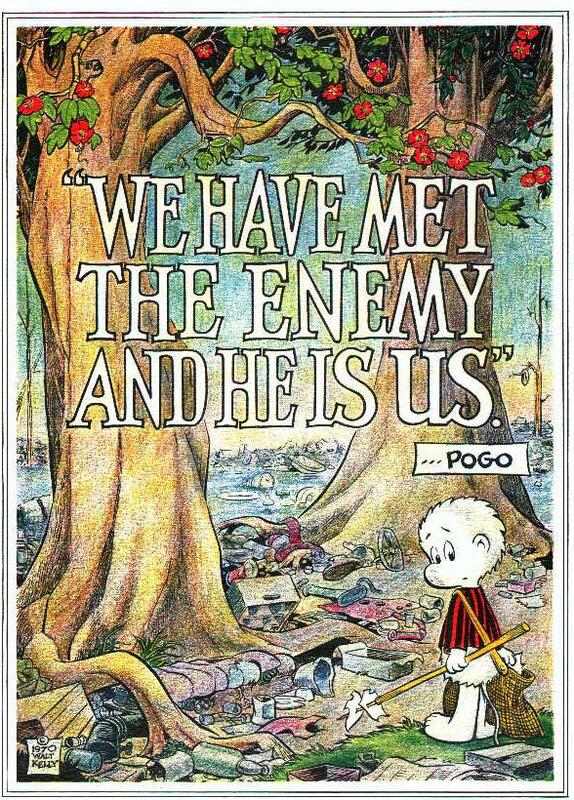 It is based on a 1970 environmental cartoon by Walt Kelly that was originally created for Earth Day, though Kelly’s use of the line goes back to 1953. I had it recreated to highlight the fact that one of the reasons we got into the mess we are in is that we spent too much time looking at our own specific charity situation and, as a result, completely lost touch with how single actions, multiplied many times had a negative impact on those we depend on. There were many other great speakers (too many to mention in this post). So, if Damian O’Broin (the founder and director of Ask Direct) is up for organising another event in 2017 (and I really hope he is) shift your training budget so you can attend. In my humble opinion, there is no better way of improving your fundraising. Update: Here’s a very worthwhile read from the Agents of Good with their take on the event. You should also read this great piece from Tom Ahern.